In other words, you are six times more likely to be killed by lightning than by a snake! It is important to remember that our native snakes are wild animals just like any other. Fear may be your natural response to snakes, but we hope that this information helps you develop a healthy respect for these creatures. They are certainly not “out to get you”, in fact, they fear you! Keep this information in mind during the warmer months as snakes emerge. Be aware of their presence, but be sure to focus more on protecting yourself from other outdoor dangers. Today’s snake of the day is a small snake that loves to hide – the Western Hooknose Snake. 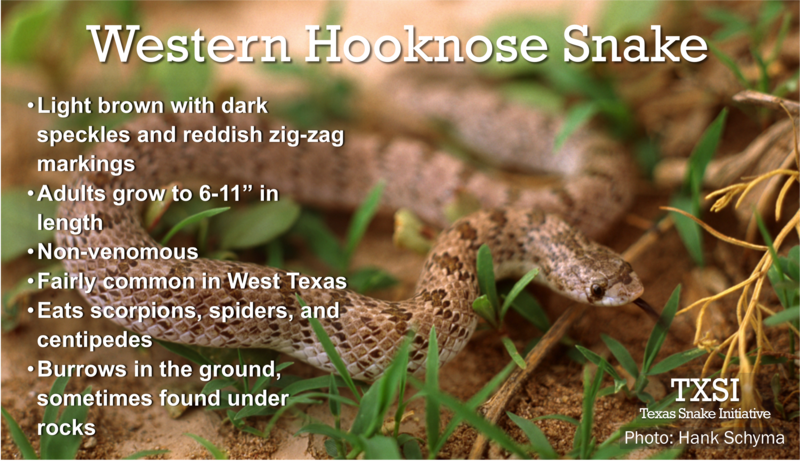 This harmless little reptile is found in West Texas, southern New Mexico, southeastern Arizona, and Mexico. 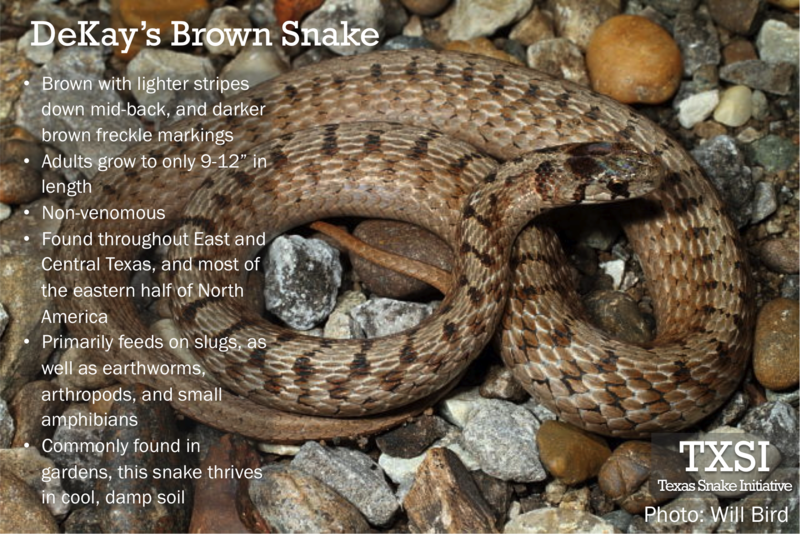 It is fairly common to find these snakes in the Chihuahuan Desert, under rocks or burrowed in the ground. Western Hooknose Snakes eat scorpions, spiders, and centipedes. If you are afraid of any of these, hope that a Western Hooknose is nearby! These snakes have interesting, “zig-zag” patterns down their backs. Their upturned nose is another identifying feature that gives them their name, and makes them look similar to the Hog-nosed Snake. Venturing into snake-y areas with your dog can be scary. Dogs are curious creatures — they love to approach anything that moves. Here we will teach you some tips for keeping your best friend safe from snake bites. Always check your walking area for snakes, especially if you walk in brushy areas. Exercise extra caution in spring and summer months, when snakes are most active. 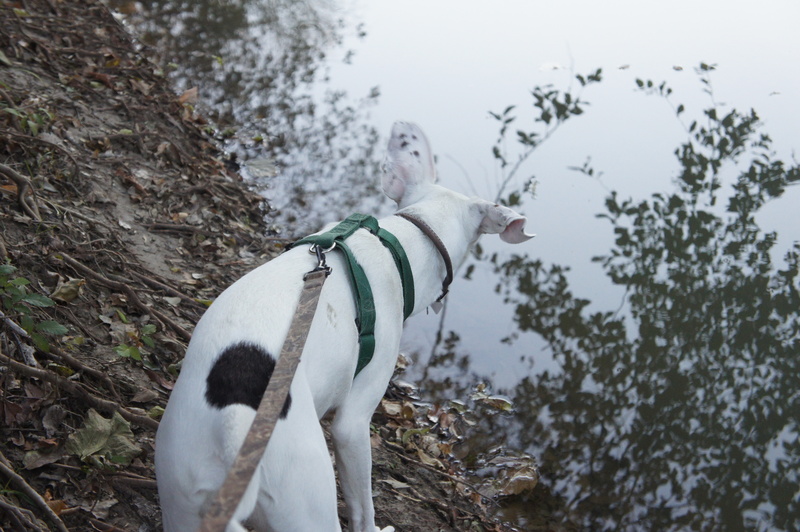 If your dog is a swimmer, try to avoid letting them swim in murky water. 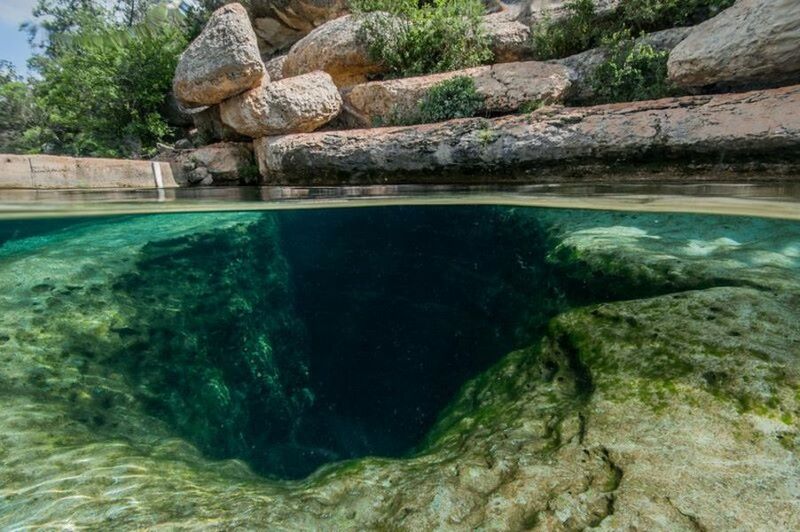 Cottonmouths, one of Texas’ four venomous snakes, can be difficult to see in cloudy water. Be aware that cottonmouths live in and around water. If you are hiking through a densely vegetated area, carry a stick. The vibrations of the stick against the ground can scare snakes away. On top of that, sticks can be used to push away leaves and grass. If a snake is around, your stick will find it before your dog’s feet. Be careful to watch your dog as they approach logs or piles of leaves. These are common hiding places for snakes, and your dog may see or smell a snake and become fixated on it before you know that it is there. Always scan water for snakes before letting your dog go for a swim. Red Rock Biologics makes Western Diamondback Rattlesnake vaccines that work for both dogs and horses. 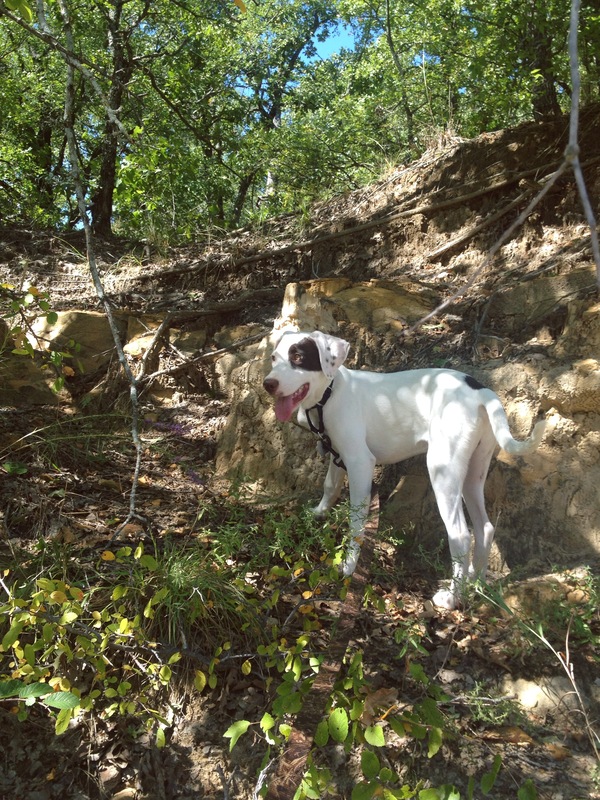 If your dog spends time near rattlesnake habitats, you should consider this vaccination. This vaccine helps dogs to create antibodies that protect against rattlesnake venom. However, even vaccinated dogs must be taken to the vet immediately if bitten. The amount of venom injected, the size of the dog, and the location of the bite all play a role in determining how effective the vaccination will be. According to Red Rock Biologics, vaccinated dogs “experience less swelling, less tissue damage and a faster recovery from snakebite than unvaccinated dogs”. Follow this link for FAQ’s about the vaccine, and talk to your veterinarian for more information. You can’t always keep your dog on a leash, nor can you always keep your eye on them. For those reasons, snake avoidance training can be a great! The training methods for snake avoidance vary from trainer to trainer. Commonly, dogs will be brought up to a venomous snake that has been “milked” of its venom or defanged entirely. Trainers then use shock collars to teach the dog that it should not touch the snake. This method is controversial — some trainers argue that shocking can have the opposite effect on some dogs, making the dog attack snakes when they see them in the wild. In addition, defanging snakes can lead to lethal infection, starvation, and unnecessary pain for the animals. Our training requires that the handler has a good relationship, or influence, over the dog as we work through modeling and guided learning…Generally, we have good success in one session and the dog will actively lead the owner around an area where it smells the odor of snakes, or has encountered one before. Practicing snake safety with your dog can put both of your minds at ease outdoors. It is incredibly important to have your vet’s number handy. In case your dog is bitten, you should be prepared to call. Locate an emergency vet’s phone number for any city you visit with your dog, in case of an after-hours emergency. 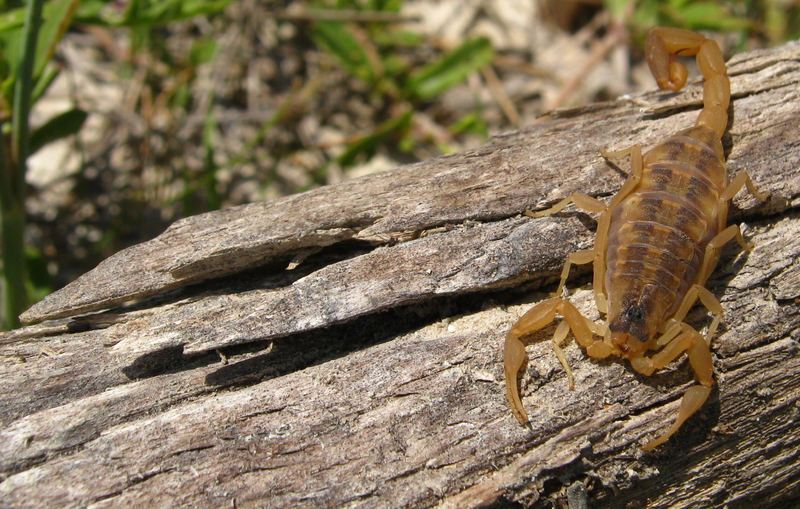 Even a non-venomous bite can lead to infection if left untreated, so go ahead and schedule a non-emergency appointment in these cases. If your dog is bitten by a venomous snake, get them into the vet immediately. They may receive a “dry bite” — snakes are hesitant to use their venom for anything other than prey. Others may be less lucky, and will need the proper treatment to counteract the venom. With the proper preparation, you and your dog can venture outdoors with confidence. Go out, have fun, and remember to respect all wildlife! Remember that old saying, “Red next to yellow, kill a fellow; red next to black, friend of Jack”? Well it is important to remember with today’s snake of the day: the Milk Snake! 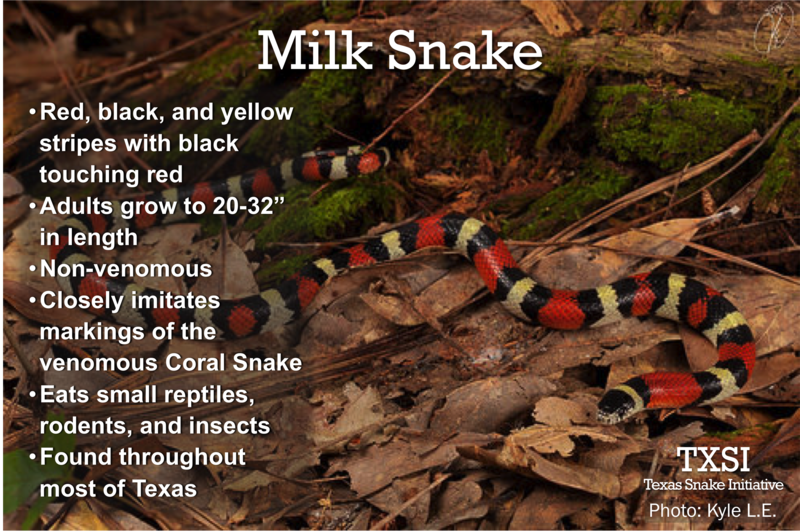 Milk Snakes are non-venomous imitators of the venomous Coral Snake, which is also found in Texas. On Milk Snakes, the red band and black band touch. Coral Snakes’ red bands and yellow bands touch. Knowing the difference is important — a bite from a Milk Snake is nothing to worry about, but a Coral Snake has potent venom that could potentially be dangerous to humans. Milk Snakes are harmless, and like many snakes are helpful predators to have around the house. They eat small reptiles, rodents, and sometimes insects. Milk Snakes got their name from a myth: people thought that they drank cows’ milk by attaching to cows’ udders! This, of course, is not true. This dazzling, tiny snake is a Ringneck Snake. There are three subspecies of Diadophis punctatus, including the Mississippi, Prairie, and Regal Ringneck Snakes in Texas. The first two are smaller, growing to only 10-12″ in length. These two snakes eat small frogs, newts, insects, and slugs. The Regal Ringneck Snake, pictured below, can grow up to 19″ in length. They consume slightly larger prey, consisting mainly of other reptiles. Ringnecks are too small to bite humans, and are considered non-venomous. However, their enlarged back teeth and paralytic saliva give them advantages over their prey. The most interesting features of these snakes are their brightly colored underbellies. They range from gold to red, with black speckles. 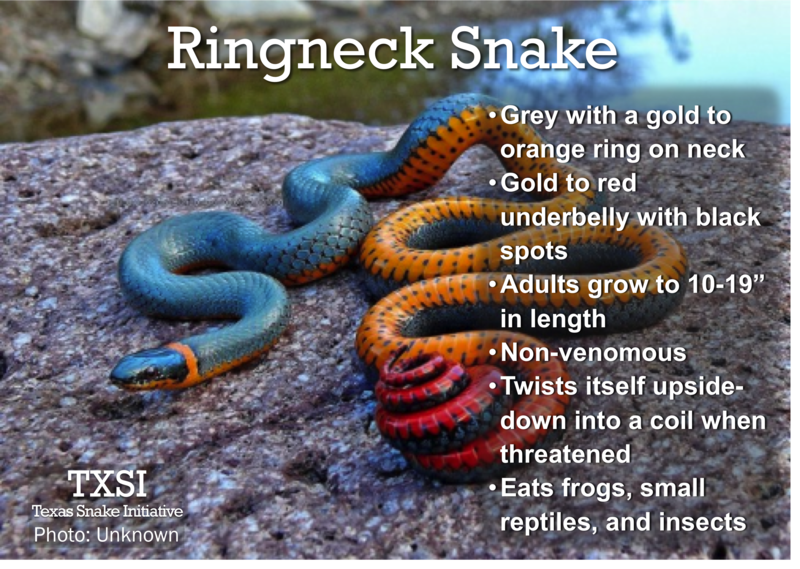 When threatened, Ringneck Snakes will flip upside-down and coil their tails as a defense mechanism. That’s not an earthworm, it’s a snake! Meet the Texas Blind Snake, Leptotyphlops dulcis. Also known as the Plains Thread Snake. These tiny critters only grow to be 5-8″ in length, and with their pinkish brown coloration they are easy to mistake for earthworms. Texas Blind Snakes are great friends to humans, in that their diets consist of mainly termite and ant larvae. Yet another snake that is great to have around the yard! 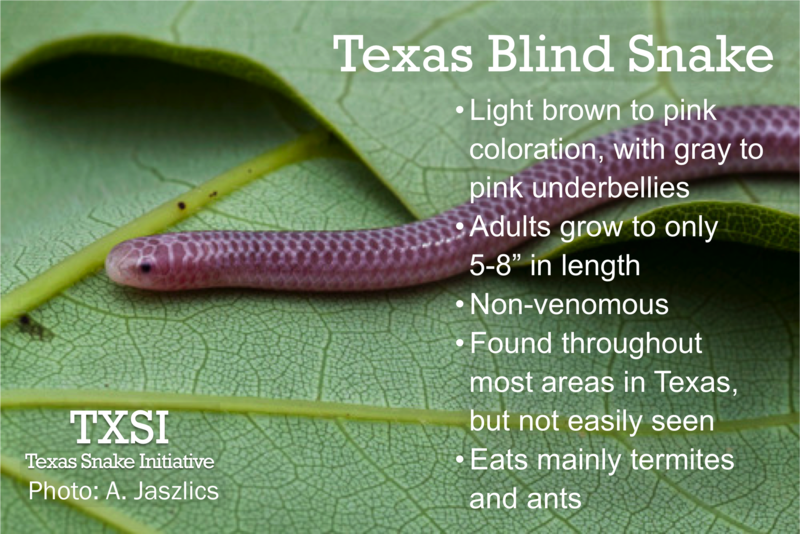 Despite the misleading name, Texas Blind Snakes are not actually blind. Their eyesight is minimal, but they can perceive changes in light with their small eyes. They communicate with other snakes of their species through the use of pheromones. These snakes are nocturnal, and are burrowers. Because of these factors, they are not easy to see, despite their wide geographic range in Texas. Not to mention their incredibly small size! If you happen to see one, be sure to thank it for controlling ant and termite populations. 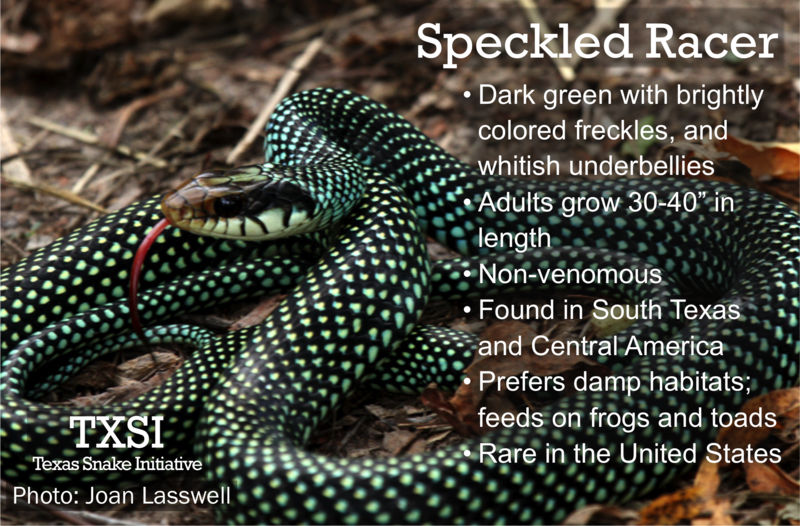 Today’s Snake of the Day is the striking Speckled Racer. This lovely snake is a rare find in the United States, in fact, Texas is the only state that is lucky enough to be home to Speckled Racers. Notice the changing colors on the freckles that decorate this snake’s back — they range from turquoise blue to yellow-green. Contrary to popular belief, not all brightly colored animals are harmful. This snake is non-venomous; though nervous and quick to bite, it can do no real harm to humans. Walking through the woods you may catch a glimpse of this snake, but look above your head rather than below your feet! Rough Green Snakes are the bright green tree-climbers of Texas. These snakes are arboreal, meaning that they climb/live in trees. 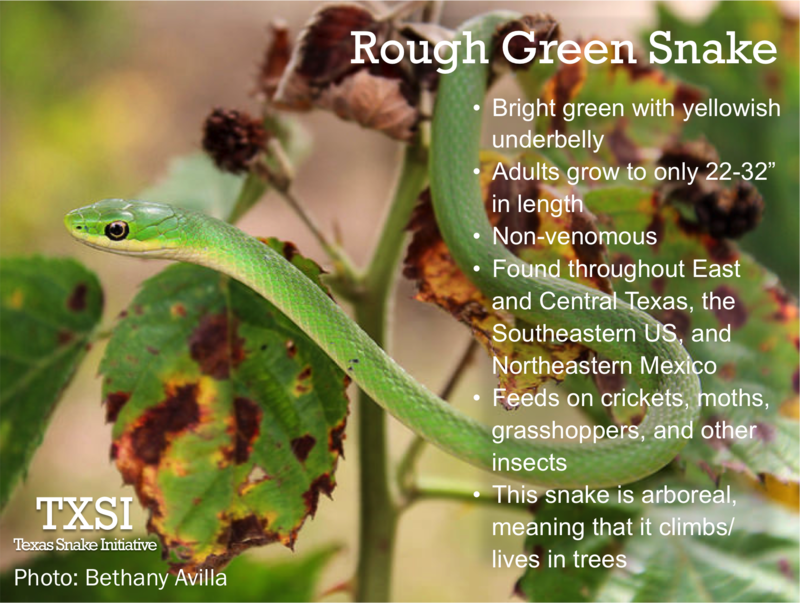 Rough Green Snakes are small and thin, reaching only 22-32″ in length. They are bright green with yellow underbellies, some with white coloring near their heads. These snakes are another species that are beneficial to humans — they eat many of the bugs that we find to be pests. Among these are crickets, grasshoppers, moths, and spiders. Have you ever come across a brown snake with few distinguishing features while gardening? Chances are that you have found just that — a Brown Snake. Brown Snakes are commonly found in gardens. They thrive in the cool, soft soil, and can find their prey in garden beds. Mainly feeding on slugs, Brown Snakes can help to naturally protect your garden from these pests. With adults only growing up to twelve inches long, these snakes are often mistaken for juveniles. However, they are simply small snakes in general! Their young are even smaller, and are typically a solid tan or brown color with dark markings on the head. If you come across a Brown Snake at your home, keep it around! This non-venomous species is harmless to humans, and can help to keep your yard free of common pests. Maybe you’ve heard of Indigo Snakes, or heard someone tell a tale of a large, black snake wandering the wilderness of South Texas. The Indigo Snake is a bit of a celebrity, famous for its diet of rattlesnakes. This species also eats other animals, including birds, amphibians, and other reptiles. Markings: Notice the orangish-reddish coloring on the chin of the featured Indigo Snake. This is one common marking to use as an identifier. Under the eye is a black stripe extending down diagonally. Coloring: This snake gets its name from its uniform, bluish black color. Its underbelly is gray. Unfortunately for the Indigo Snake, its fame has not protected it from hunting — it is considered a threatened species. 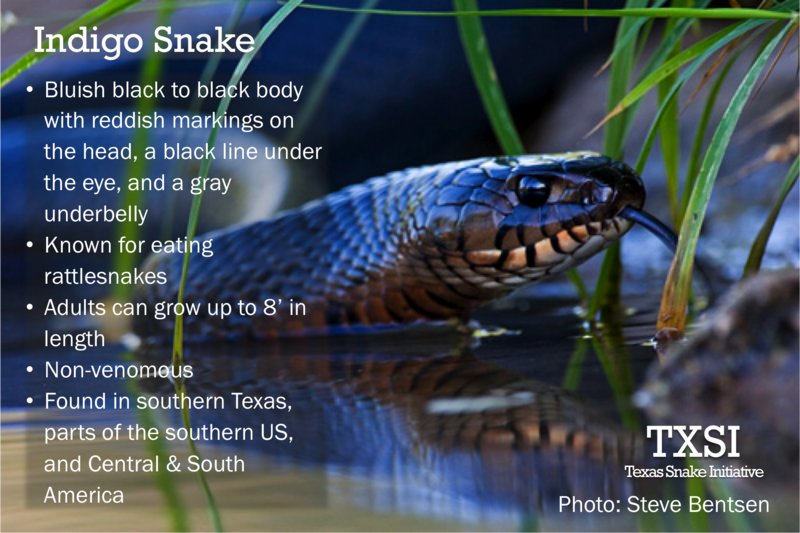 Watch out for these snakes in South Texas, and help to protect them from endangerment by leaving them in peace.